What can one say about Dean, that dude loved blueberries...and hated grapefruit. I loved it when he turned into a pink tennis ball and when he would try to chirp louder than everyone else who was talking. The best, and saddest was when he had the worlds tiniest cast on his foot. Dean you are my second favorite of the Nohl/Hajny pet clan. Hopefully you are in a better place now full of blueberries and where there's no Oliver...because Oliver is dumb and the worst. Daily Pattern: Minneapolis or Bust! Daily Pattern - Can I buy you a drink? Ten Paces and Draw: Handsome Gents! Daily Pattern - Bow tie Party. Daily Pattern - Happy Father's Day, Dad! Today is a cupcake kind of day. Daily Pattern : Air Mail - Special Delivery! Daily Pattern : OM. Say it with me. 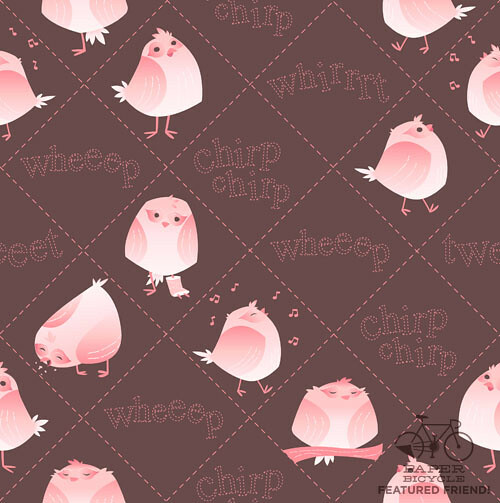 Daily Pattern: Minerva GM's Pink Canaries! Daily Pattern - Get in the pool!